We believe that feelings are immutable, but every sentiment, particularly the noblest and most disinterested, has a history. Michel Foucault, "Nietzsche, Genealogy, History"
A son's property is angsa (family property); a daughter's property is māyā (love). On a spring afternoon in 1998, I witnessed a small event in Nepal that was a common sight at the time. Several young women, dressed in saris and sandals, were standing at the central Palace Square of Patan (a city adjacent to Kathmandu). Behind them lay a white sheet draped across the palace stones and decorated with hundreds of signatures scribbled in thick magic marker that they later paraded around the city. This was one of the numerous demonstrations organized around the hotly debated legal movement that argued for a daughter's birthright to her parent's ancestral property or angsa. Angsa literally means "share" or "portion," and it refers to the share of joint property of land or houses passed from grandfather to father to son. Until recently, all sons and their mother had equal inheritance rights to a share of angsa from the father's family. Daughters only received angsa through marriage or from their parents if they remained unmarried until age thirty-five. While the activists stood at the Palace Square and as they walked through the city, they yelled into a microphone at pedestrians who passed by on the street: "Women should have equal rights to property! Women of Nepal are also citizens! We deserve our equal rights! Sign here for freedom and equality! Raise your voices for women!" In this chapter, I discuss the invocation of voice by contemporary activists of the property reform movement alongside a competing formation of voice, linked to intimacies of home, that emerged within debates about this reform. Divergent birthrights to angsa not only create material divisions of wealth between sons and daughter, I argue, but also produce gendered divisions of speech and action, which are particularly evident in this second formation of voice. To trace the different meanings of voice at play in this angsa reform movement is to trace the links between class and gender subjectivities, both of which are inseparable from property relations and different ideologies of intimacy. In my analysis, I pay close attention not only to the arguments of liberal reformers, but also to the words of people who opposed the introduction of a new right for daughters. It is here where we begin to see the links between voice, subjectivity, and angsa unfold. The angsa campaign highlights several social issues that have characterized the period of democratic reforms after 1990. The reform movement was one of the early examples of an attempt to destabilize the center and the foundation of the state, albeit an attempt undertaken from within the state apparatus, the law. It also resonates with other attempts to reimagine a New Nepal today, from those of the Maoists to those of the southern Madeshi separatists, which are also contests about property relations. In these other attempts as well, people in Nepal are imagined as "raising their voices." While clearly a national issue, there are many Nepalis, such as sukumbāsī (squatter communities), kamaiyā (former bonded laborers), and many dalit (low-caste) families, who do not have property to inherit or to pass down. Their relationship to landed property involves complex interfamily relations within villages or in the urban center, which differ considerably from the middle- and lower-middle-class urbanities I discuss here. While I do not address the specific ways in which this law affects such groups, it is worth noting that people without property still share certain key cultural concepts, such as māitī (married woman's natal home), that figured centrally in the debates about angsa reforms. The debates this reform movement generated resemble the debates that raged around the Hindu Succession Act of 1956 in India, which similarly sought to give women an equal share to their parent's property (Agarwal 1994; Basu 1999, 2001; Majumdar 2009). Yet, the Nepali solution differed significantly from the Indian one several decades earlier. In India, "the Hindu law debates made it clear that property inhered in the family, identified by its male lineage" (Majumdar 2009: 237). The angsa reform movement in Nepal, by contrast, was felt at the time to be one of the more radical challenges to Hindu hegemony in that it posed genuine threats to the gender relations that were a foundation of Hindu national patrimony rooted in a Hindu state. It is no surprise, then, that the law granting full and equal rights to angsa for daughters from birth, before and after marriage, was passed in November 2006, after the interim constitution declared Nepal a secular state. Here I focus on the imagined possibilities and debates at the time about what could happen if this reform bill were passed, which tell us something important about deep cultural tensions around questions of class, gendered subjectivity, and voice during this period in Kathmandu. Debate about this proposed property reform was a public affair. It was not secluded to bureaucratic offices nor confined to courtroom dramas. Rallies were organized. Banners of signatures in support of the reform were paraded around the city. Piles of newspaper articles and opinion pieces were written. TV serials were broadcast. Informal and staged conversations about the proposed bill could be heard on buses, in rickshaw rides, and in heated discussions on the street or in homes. The furious debates that erupted in response to the proposal for daughter's property rights forged deep clefts between religious purists and those arguing for novel democratic reforms, between conservative ideologues arguing against a shift in property relations deemed to be an "authentic and timeless Nepali tradition" and those embracing liberal paradigms who felt the existing angsa system hindered individual agency. All of these practices invoked the figure of voice. There are two distinct understandings of voice that emerged in the property reform movement. First, the notion of āwāj uṭhāune (raising voice) is associated with democratic participation and political consciousness, and implies a common parallel between voice and collective or individual agency. In relation to this particular reform, āwāj uṭhāune resembles feminist scholars' frequently invoked "voice," a metonym that stands for women's agency and desire for freedom. Within this terminology is the supposition that the voice directly channels subjectivity, and that a "subject with a voice" is a universal liberal subject who always, even in small, subversive ways, seeks freedom and autonomy from cultural, social, religious, and other traditional constraints (Mahmood 2005). Activists supporting the property law reforms frequently invoked this liberal form of voice, such that āwāj uṭhāune became a metaphor for "empowerment." But those defending Nepali "tradition" appealed to a different discourse of voice. This second formation of voice emerges in the hailing practices of brothers, who call their married sisters back to the place of their birth. These practices support family intimacies and gender divisions within the family, and regulate who speaks and who replies. The two forms of voice invoked through the property law debate both suggest a close relation between voice and subjectivity, but they represent distinctions between liberal and nonliberal subjectivities in Nepal. In both cases, the figure of voice and the politics of speaking (or being hailed) constitute different subject positions that are implicated in the debate about daughter's inheritance of angsa. By attending ethnographically to these different invocations of voice, rather than using them uncritically in our own scholarship, we avoid occluding the intimacies, affects, and subjectivities at stake in these legal reforms. Activists and opponents alike viewed the angsa reform movement as a realization of democratic ideals and, therefore, as an effective form of āwāj uṭhāune: the movement worked both to engage a largely nonpolitical public sphere and to promote the first political challenges to the constitution in a multiparty democracy. Activists had attempted to reform the law in two primary ways: by submitting several bills designed by NGOs and the Government's Ministry of Women to change the law, and by filing a Supreme Court case against the government. In their register associated with democratic speech, āwāj uṭhāune practices often seek to challenge the state at its deepest level. The lawyers involved in the campaign were proud to claim that this legal reform was the first constitutional challenge since the rewriting of the constitution in 1990. They used the new constitution's statement of equality to declare the existing angsa laws unconstitutional, providing precedent for future constitutional challenges. The way the campaign and controversy were staged also provided examples of different forms of voicing as political expression, from the public marches with signature banners, to the planned loud conversations on buses in which activists discussed the proposed bill with strangers and set the discourse about the reform in motion, to the ample media coverage. Finally and most poignantly, the phrase āwāj uṭhāune implies a connection between voice and agency that relates explicitly to the final aim of this campaign. Giving daughters equal rights to property, activists argued, would empower women by giving them a voice in the family to resist oppression; they would be able to act on their own and feel themselves to be members of their family and, more profoundly, citizens of the state. "Angsa is one's own property, right?" one of my friends shouted to her father, during a heated argument on the subject. "If a person has something of one's own, that person can do something." This ability to act is embedded within the material relations of angsa, and having property, like "having a voice," is deemed to be directly linked to women's agency in relation to the family and the state. Such an ability to act when given angsa is quite striking when we look at the biographies of the prominent women activists and lawyers involved in this campaign. Nearly all of them had received a portion of land or house from their family in the form of an icchā patra. Icchā patra, or "document of wish," functions much like a liberal will system; it is a legal category of inheritance law that enables a person to give away a portion of their personal property to anyone they wish. As Daniel Karpowitz (1998) shows, the significance of icchā patra grew when niji ārjan (individual or privately earned money) became a more clearly identifiable legal category in 1977. Significantly, the activists did not argue for angsa to be abolished and replaced with the category of niji ārjan, which could be willed away by an individual, as is the case in a liberal model of property law. Despite their seemingly liberal rhetoric of voice, the activists sought to retain an illiberal, Hindu form of inheritance that kept property within the family. The alternative formation of voice invoked by those opposing the bill is tied to familial intimacies, particularly the intimate relations between brothers and sisters. When I talked to Nepalis living in Kathmandu about the bitter controversy surrounding this legal reform, most would try to explain what they thought I did not understand. The essential but implicit meanings of angsa needed to be spelled out to someone like myself, since I might be partial to the international groups supporting this reform. Without hesitation, many would sum up their objections with the following pithy statement: "A son's property is angsa, and a daughter's property is love" (Chorāko sampatī angsa, chorīko sampatī māyā ho). Māyā (family love)is expressed most poignantly in the common practice of a brother calling his married sister back to the home of her birth. A son's inheritance and possession of angsa, most people told me, requires him to invite his married sisters home. Such visits are described using a common Nepali word, bolāune. Bolāune is often translated with the innocuous "inviting" or "addressing," but I prefer a more pointed English gloss that captures the social relations embedded in the word: "summoning," "calling," or "hailing." Inheritance of angsa is, they suggest, intimately intertwined with a daughter's frequent visits home: indeed, this is where the power of angsa circulates. Though undocumented in the actual laws, women's frequent movement back and forth might be seen as an inscription of the written law in daily habits, marking a daughter's dislocation from her parents' home, while including her, temporarily, within a home she has left behind. Translated literally into English, bolāune means "to make someone else speak," and it generates a different form of recognition, speech, and agency than the activists' vision. Practices of bolāune are, then, constitutive of gendered subjectivities; they are the means by which people come to think of what makes a man into "a man" and a woman into "a woman." The practice of bolāune, as everyday as it is, emerged so frequently in conversation about the reform because, I gradually learned, it reveals and defines the hierarchies of gender that the activists sought to change with the proposed new law. My analysis of these competing formations of voice uses crucial insights generated by anthropological studies of property and feminist analyses of kinship and family intimacy. While I draw upon many feminist theories of kinship and intimacy, from the outset this campaign poses important challenges to the standard feminist analysis that would interpret the activists as "empowering women" through the law and thereby representing a "women's voice." Such arguments do not offer a deeper understanding of the different subjectivities at stake in this campaign, and are rooted in a common feminist concern for women's agency. In the early 1990s, Saba Mahmood points out, this attention to women's agency among feminist theorists was often articulated through the rhetoric of "resistance" to structures of male dominance (2005: 10). Even among writers who problematized the notion of "resistance" as a simplistic understanding of power relations (Abu-Lughod 1990; Ahearn 2001; MacLeod 1992; Ortner 1995), feminist scholars typically remain committed to a liberal notion that all women (or all people for that matter) desire freedom from relations of subordination (culture, tradition, male dominance) (Mahmood 2005: 10-17). Saba Mahmood's book on reimagining the feminist subject provides a model for understanding other modern subjectivities that do not fit the liberal model. As Mahmood argues, feminist analyses make certain "normative liberal assumptions about human nature" (2005: 5); feminism is, after all, a liberal discourse. These assumptions include that there is an innate desire for freedom, that all human beings assert autonomy when they can, and that human agency is exerted in acts that challenge the norms rather than uphold them (5). From Mahmood's perspective, these assumptions occlude any deep analysis of nonliberal subjectivity, such as the religious Islamic women in Egypt with whom she works who adhere to "feminine virtues" (modesty, humility, shyness) as a condition for their place in religious and political life. Religious Egyptian women, then, challenge many of the feminist assumptions about human nature. This chapter expands upon Mahmood's insights by thinking ethnographically about the various forms of voicing used in the property reform, and the different subjectivities they assume. To begin, we must consider the question of what is property and what it does. Anthropological studies of property emphasize the social relations embedded in all property relations (Verdery and Humphrey 2004). Complicating the writings of John Locke, who saw property as a particular relation between citizen and state, anthropologists have questioned the assumed notion of personhood embedded in Euro-American concepts of private property. In her study of the shift from collective farms in Transylvania to individual family farms, for example, Katherine Verdery argues that a focus on "rights" obscures a more significant change occurring in the kinds of person constituted by different forms of property: "Rights terminology creates only one kind of person, who has or does not have rights. Deemphasizing such language helps to reveal more clearly the different kinds of persons that property restitution creates: the efficient 'master of the land' on the one hand, and those ground down by accountability, risk, and debt on the other" (Verdery 2004: 16). In a similar vein, I argue here that the social relations and especially the intimate sentiments that inform specific subjectivities and ideas of personhood cannot be fully accounted for as a relationship between citizen and state (cf. Tamang 2000). Clearly, the national codification of property relations produces a legal subject and citizen, but relations of property are much broader than this. They also shape affective and moral subjects associated with practices of speech and recognition like bolāune and āwāj uṭhāune. Despite the rhetoric of some lawyers, change in the inheritance law does not do away with sentiment in favor of a more rationalized legal structure.Feminist anthropologists have long underscored the centrality of sentiment in understanding broader political and economic agendas of the state and beyond. Much of state knowledge and rule depends on what Ann Stoler refers to as a "calculus of sentiments and on interventions that would cultivate compassion, contempt and disdain" (2002: 93).The state laws of angsa support feelings of attachment between brother and sister, as well as husband and wife, and patterns of care and compassion among particular family members. While it may be obvious why opponents framed their arguments around issues of sentiment, it is important to recognize that many activists did as well. Rather than celebrate the love relationship between brother and sister, however, activists focused on the ideal bonds of romantic love between husband and wife. Sentiments of love, care, and compassion lie at the core of political debates about the angsa and they reveal what is at stake for both activists and their opponents alike. It is here that we see some of the pervasive and subtle means by which angsa exerts its most powerful cultural effects. Debates about property are bound up with debates about changing relations of love. Nepal's first woman lawyer, Silu Singh, wrote the first polemic against the existing angsa system in 1975, in which she argued that reform in angsa would engender a more "genuine" love between husbands and wives. This more "genuine" love would flourish with a reform of the angsa laws, she wrote, and would be the kind of love presumably unaffected by differences in wealth (Singh n.d.b). Silu Singh imagines authentic love to be the love of an equal, companionate marriage, in which husbands and wives grow to think about themselves primarily in affectionate rather than instrumental terms. But this notion of "genuine love" is not divorced from material concerns, for according to Silu Singh it is the fact that women will come to the marriage with property that provides the conditions for "genuine love" to flourish. Silu Singh's invocation of "genuine love" bears a striking resemblance to the connection between love and inheritance that Fredrick Engels made, almost a century earlier, in industrial Germany. Engels was arguing against the common perception that modern marriages were consensual, that is, based primarily on the love between two individuals rather than a contract between families. As Engels argued, the choice implied in love marriage or marriage by consent is never completely free, particularly when matters of inheritance are at stake. Even in countries that pride themselves on marriage by "free consent," property and children's inheritance nevertheless shape the choices children make. "Full freedom of marriage can therefore only be generally established when the abolition of capitalist production and of property relations created by it has removed all the accompanying economic considerations which still exert such a powerful influence on the choice of a marriage partner" ( 1891: 144). In contrast to Silu Singh's confidence in liberal capitalism eradicating familial gender hierarchies, Engels argued that a true love marriage could only take place among the proletariat. The notion of "genuine love" that Silu Singh espouses entails a particular intimate subject who is imagined to be unencumbered by social pressures, a person who can love without restraint and who has access to "their own voice," a freedom ostensibly made possible by capitalist accumulation and an equal inheritance of property. The category of "genuine love" that activists like Silu Singh declared would result from a change in property law must be seen as a socially constituted form of affection closely tied to bourgeois material interests, the growth in capitalism, and liberal democratic ideals. And this is not all that surprising. As Rochona Majumdar (2009) has argued, the question of romantic love and companionate marriage has been at the center of marriage debates in India since the early part of the twentieth century, as the joint family persists as an ideal alongside the romantic couple. Rejecting the idea that arranged marriage is a sign of tradition, backwardness, or lack of consent in Indian marriages, Majumdar points out that this view is "a byproduct of the coupling of love marriage with progress, choice, agency, and modernity" in much literature about modern European marriage (2009: 7). Feminists scholars, anthropologists, and social historians have worked hard to show that gender relations acquire novel forms of inequality in modernity, and that romantic love or intimacy itself is not separate from material interests and social forces that create the conditions for individual choice (for example, Ahearn 2001; Berlant 1998; Illouz 1997; Jankowiak 1995; Povinelli 2002). The move from "instrumental" love to "consensual" love, ostensibly based on authentic, individual feeling, is itself an ideological effect of modernity that obscures the historical links between romantic love and the political economy of modernity. The property law reform movement's advocacy of a more equal, companionate marriage invokes the same kind of intimate subject as that presumed and produced via the FM radio programs discussed in later chapters. At the same time, as I show throughout this book, ideas of romantic love exist alongside other forms of familial love (between parent and child, between brother and sister) that appear to challenge the ideals of parity implicit in companionate marriage. But to simply tag this form of love as "instrumental" is to confine it to a liberal model that does not fully recognize the richness of the matrix of social relations that emerge in practices like bolāune. These various modes of love and their attendant variations of intimacies are simultaneously (re)produced in the property laws and debates about angsa I discuss here and in rituals of "seeing face" that I discuss in the next chapter. As contested transformations of the intimate subject within a Nepali public sphere, they both appear as practices that reveal, alter, and call into being a voicing subject, the subject with a voice, or a subject called to speak. The importance of sentiment and desire in many feminist analyses has also reshaped anthropological studies of kinship. While there was little concern for intimate domestic arrangements or emotions in mid-twentieth-century studies of kinship (Carston 2004), early feminist anthropologists sought to revise theories of kinship by showing the broader political, economic, and social significance of family, domesticity, intimacy, and sentiment, areas of social life then deemed "feminine" and thereby considered "private" and peripheral to more central aspects of social life (Carston 2004; cf. Ortner 1974; Rosaldo 1980; Rubin 1975; Yanagisako and Collier 1987). Attention to gendered sentiments, as they relate to property, capital, and kinship, enables a more subtle understanding of people's desires and investment in the continuity of their family line. In Sylvia Yanagisako's (2002) work on family firms in Italy, for instance, she criticizes kinship studies for privileging law over sentiment, and turns her attention to the gendered sentiments and forms of patriarchical desire that shape capitalist families' vision of family continuity. Sentiments, for Yanagisako, "operate as a force of production and reproduction in family firms" (2002: 85). For theoretical as well as ethnographic reasons, Yanagisako separates the sphere of law and sentiment, claiming that while law provides important means to help families maintain security in changing political-legal contexts, law is not the basis of family continuity, contrary to early kinship studies (2002: 84). In the context of the Nepali legal reform, we see clearly that sentiments of love and care are crucial for maintaining the lines of family, but these sentiments are imagined to be integrally entwined with state law. In this case, then, for theoretical and ethnographic reasons law and sentiment must be seen as coproducing each other. It is no coincidence, Laura Ahearn suggests, that serious scholarly consideration of sentiment and particularly romantic love across cultures occurred in the late 1990s, when there were more women, with more power, in the academy (Ahearn 2001: 270-71; cf. Jankowiak 1995; Rebhun 1999). 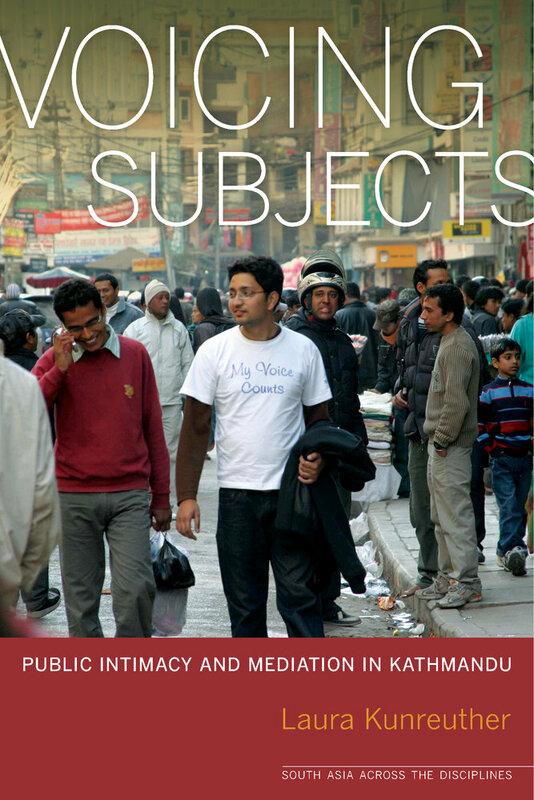 Ahearn's own work on marriage, love, and kinship patterns in Nepal has paved the way for understanding the discourse of romantic love, the changing forms of intimacy, and the agency that underlie my exploration of public intimacy throughout this book. By critically examining the category of "love" in Nepal, Ahearn's work shifts the analysis of marriage and kinship from a discussion about a static social institution of sociocultural reproduction toward an emphasis on social change. Ahearn's focus on love-letter writing among Nepali villagers reveals the effects of many modern institutions-from education to development-on desire, intimacy, and representations of self. Ahearn looks at what she calls "indigenous theories of agency," or when people directly speak about causes of action or decision-making. She finds that the young Nepalis she spoke with tend to more often assume their own responsibility for practices like marriage and elopement, in contrast to decades earlier when villagers attributed the cause of their own marriages and elopements to witchcraft or fate. A study of the discourse of love and marriage in the contemporary moment, Ahearn suggests, reveals shifting ideologies of agency. Liberal notions of agency suffuse practices and discourses of romantic love, with love marriage conceived as a paradigmatic "contract" presumably founded on individual choice. Love may in fact be considered the ground upon which autonomous judgment first emerges, which is later deployed in the space of civil society such as the legal reform discussed in this chapter and the FM radio discussed in later chapters. The love letters Ahearn discusses are forms of intimate recognition through which young Nepali villagers come to see themselves and become who they are by addressing another. This form of address recalls Habermas's discussion of the development of an "audience-oriented subjectivity" in modern Europe that initially took shape through the "private" exchange of letters within a conjugal family (1989: 46-51). In Habermas's argument, modern forms of domestic intimacy consider love to be a judgment of the individual, radically separated from any instrumental consideration. Intimate recognition, Elizabeth Povinelli (2002b) points out, became a way to refuse utilitarian domestic relations in modern Europe. "To assert a bond of love," writes Povinelli, "was to assert simultaneously a rejection of social utility" (2002b: 230). Such domestic relations, in turn, make possible aesthetic and political considerations in the public sphere, where, as I discuss in the chapters on FM radio, a similar form of intimate subject emerges that is always already oriented toward an audience, addressing another through the representation of self. Though the activists did not use the same kind of self-addressing narratives (aside from the signature campaigns), their notions of autonomous judgment implied in the discourse of āwāj uṭhāune may very well emerge from the discourse and practices of romantic love that they also profess. While activists used ideas of romantic love to support their campaign, it is important to recognize that these modern forms of intimacy do not replace genealogical and familial attachments. Love provides the means of linking genealogy with emergent notions of national citizenship (Povinelli 2002b). The Nepali property reform movement aimed to keep a traditional form of Hindu patrimony and simultaneously transform the gender relations upon which this genealogy is based. As Nepali activists proposed, this legal change not only would change familial intimacies but also would realize a national citizenship based on individual equality, as prescribed by the constitution of 1990. "To be sure," writes Povinelli, "intimate love makes a family human, but love must still culminate in a family, a domestic or communal plot, a social group that adheres" (2002b: 234-35). Similarly, as Ahearn points out, individuals work hard to confirm the interests of their families even as they profess their own love for another that may oppose the family in their love letters. What is striking here is that the activists do not imagine a new form of family (that is, nuclear family) or a legal doctrine founded upon ideals of individual choice. Instead, by including daughters as rightful heirs to property that traditionally marks a Hindu patriline, the activists reimagined the lines of Hindu genealogy. The Hindu Succession Act of 1956 in India ultimately failed (Basu 1999; Majumdar 2009) because it did not maintain the birthright within a joint family, creating "loopholes" in the form of wills ensuring that the male patriline remain intact (Basu 2001). Summarizing conflict in the Indian reform, Srimati Basu states, "Those who wanted to retain male privilege in joint family property were thus reassured that legal loopholes had been left to ensure that the status quo would not be unduly disturbed, and that wills could be written to disinherit women if so desired" (Parashar 1992: 128, cited in Basu 2001: 260). The more radical challenge the Nepali reform posed to the genealogy was revealed in the changing relations of love this new law would entail. The love between brothers and sisters-a love described as based upon daughters' unequal relation to their father's property and genealogy-comes under stress with this proposed shift, and emerges as a central feature of the Nepali legal debate. These two forms of love took shape through two different formations of voice that I mentioned briefly above. "Raising voice" (āwāj uṭhāune) relates to the role of the state in cultivating individual will, choice, and desire, and practices of bolāune characterize a subjectivity defined through familial relationships, duty, and obedience, which was supported by state laws of angsa. Interestingly, in much of the activists' work on this reform the familial and the democratic forms of voice overlapped. On the one hand, they challenged both the state and the family patriarchal order upon which state law is based; on the other hand, in refusing a liberal will system, they confirmed existing family and state ideals of traditional Hindu property. It is important to state explicitly that part of the reasoning behind the activists' policy suggestions was their own anticipation that parents (that is, fathers) would not make choices based on equality, should they adopt a will system. By keeping ancestral property within the family through state law, activists reasoned, daughters would be granted more equality and "voice" within the family than if they completely liberalized the law with a will system. By maintaining a nonliberal system, in other words, they would enable liberal ideals of equality to be realized and would encourage a "woman's voice" to surface in the family and in public. Opponents-many of them women-rejected these claims and argued that such a change would eradicate the platform on which they were called to speak, through their brother's hailings. By focusing on the figure of voice in this property reform, we encounter broad questions about the relationship between speaking and subjectivity as they connect to gender and class. All of these relations take on new meanings as Nepal bears witness to dramatic reforms that seek to restructure the state, the public, and the idea of a personal and political voice. This emphasis on the voice and its mediation of intimacy articulates the broader stakes of this debate, which goes far beyond the question of "women's rights" and ultimately raises questions about the relationship between property and personhood, sentiment, law, and subjectivity. Angsa produces specific material and affective relations between kin that, over the past forty years, became a national model that stood for the "Nepali family," despite the ethnic diversity of Nepal. For men, angsa has been a declaration of ownership and a material mark of their name. For daughters, who usually leave their parent's home in marriage, angsa has been their father's family property from which they were excluded, unless they never marry. For married women, it has been the property their husband has or will inherit, to which they also have a legal claim as wives. Angsa has been a legal regulator of women's sexuality and a defining feature of masculinity: a mark of what all men possess at birth and what women only tentatively acquire when they marry. Precisely because of this birthright to parental property, sons are the keepers and active agents in a public display of family memory. It is because of angsa, many people said, that sons care for their parents in their old age (though this is a subject of much debate), perform the death rituals for their parents when they die, and invite their sisters home. Many anthropologists have discussed the significance of inalienable possessions like angsa as powerful because they are things that can never be lost and they transcend the permanence of death (Weiner 1992). Inalienable possessions, Paul Kockelman (2007) has argued, are "almost a necessary and sufficient condition for being fully and prototypically human" (2007: 351). Across a range of domains, from grammatical categories to discursive objects and life-cycle rituals, Kockelman shows that the category of inalienable possession is tied to things that are inherent in being a person. At the same time, they are also uniquely identified with particular persons in all stages of their life, as is the case with angsa and its association with brothers and sons. While much more could be said about inalienables, these links between personhood and inalienable possessions that Kockelman identifies suggest the deeper stakes of the angsa reform movement. Put simply: to inherit angsa is to be a full human being in Nepal. The roots of the angsa reform movement go back at least to 1964, when various customary inheritance practices were replaced by a uniform code of state law (Gilbert 1992; Hoefer 1979). Prior to this time, during the century-long Rana oligarchy (1846-1950), laws of inheritance were considered matters of custom, practiced differently among the diverse ethnic groups that populated the hills, the plains, and the Kathmandu Valley of Nepal. With the establishment of the Panchāyat government in 1960, the Mulukī Ain (state legal code) was significantly transformed. Caste (jāt) and ethnicity, the very cement of the prior Rana legal code, virtually disappeared from view. In place of caste, the laws inscribed the individual, and the individual family member (Gilbert 1990). As Kate Gilbert writes on the laws of 1964: "All individuals are free to act in accordance with the national law, and are acting legally so long as they comply with it, regardless of the customs appropriate to their kul [kin group]" (1990: 7). Authority over rules of inheritance thus shifted from the power of the kin group to the power of the state, just as the legal identity of Nepalis shifted from an ethnic or caste identity to individual citizenship. Changes in these and other laws were part of the creation of a national, citizen subject. Changes to the laws of property were exemplary of a broader Panchāyat nationalist program built around Hinduism, the Nepali language, and the ideals of bikās (development). This was a moment when international development became a significant presence the Nepali economy, and ideologies of bikās took root in school textbooks and histories (Fujikura 2001; Onta 1996a; Pigg 1992). The property laws of 1964 responded to these national aspirations. On the one hand, the Panchāyat government sought to modernize and therefore secularize the legal code, eliminating all punishments that discriminated according to caste (Gilbert 1990; Sangroula and Pathak 2002). At the same time, the new legal individual in the revised legal code also supported a state nationalism that promoted the idea that to be Nepali was to be Hindu. The property laws of 1964, for example, substantiated a specifically Hindu patriarchy, based on patrilineal lines of descent and a strict regulation of women's sexuality. This system of inheritance, which grants all sons a birthright to angsa, became a nationally mandated practice, potentially affecting even Nepalis who do not consider themselves to be Hindu.Even though these laws were only thirty years old, conservative opponents of the legal reform in the 1990s appealed to them as embodiments of "Nepali tradition and custom from time immemorial." Most modern states similarly stake their legitimacy upon claims to a specific and long-standing tradition. In the context of the debates around this reform, it is important to keep in mind that these practices and laws do have a history, and in this case, a national history that is not that old. In the first incarnation of the new national inheritance laws, unmarried daughters only had rights to half of an inheritor's share of the angsa property, which they had to relinquish should they marry. In 1975, during the International Year of the Woman, Queen Aishwarya made sure that some changes were made to the constitution that reflected well on Nepal from the eyes of the international community. There were two amendments made to the law that gave unmarried women a right to property, after thirty-five, and enabled easier divorce with rights to angsa after fifteen years of marriage (Government of Nepal 1975: §13:10). The amendment of 1975 might be seen as a precursor to the recent change in the angsa laws.Many of the same activists were involved in both attempts at legal reform, and it was after these changes that several women lawyers first suggested a change to daughters' inheritance rights. These amendments, like the law of 1964, defined a state-sanctioned idea about the proper sphere of women's sexuality. A wife who slept with her husband and bore him children had rights to her husband's property should he die. But if this widow remarried, or was even seen with another man whom others find suspicious, she lost her rights to her former husband's property. Similarly, an unmarried woman who was over thirty-five (and presumably a virgin) had rights to her father's property, but should she marry after thirty-five she would lose these rights (Gilbert 1990: 28). Activists working in the 1990s implicitly aimed to shift the significance of angsa away from being a sign of women's sanctioned sexual activity or virginal status to a provocative sign of her inclusion in the father's genealogy (vangsa). In 1977, there were certain subtle but important legal adjustments to the laws of angsa that responded to and encouraged critical economic changes occurring at the time. A bill was passed that enabled an easy, practical separation between brothers who, as members of a joint family, often shared both earnings and inherited property. The bill made it much easier for men to distinguish their personal acquisitions (niji ārjan)-money earned from one's own skills, gifted property, or salaried jobs-from the angsa property that they were required to share with their brothers (Karpowitz 1998). This was the first time the word niji (personal, individual) was used in the law code, reflecting its significance as a viable legal and social category. Privately earned money was obviously becoming an important form of wealth, particularly for men, as the professional class in Kathmandu grew. Men who advocated for this slight change viewed it as "their law" and acknowledged the radical shift this amendment posed. One businessman explained the change to me in practical terms, "Men were earning but their brothers were claiming it. So they were getting fed up." Another middle-class lawyer told me: "In 2034 v.s. , a new concept came." Chuckling, he added, "the capitalist system." Clearly, this change in the law had significant effects on the so-called traditional Nepali joint family that was constantly invoked during angsa movement in the 1990s. Strikingly, the reform of 1977 passed without a peep, with no public controversy. No doubt this silence has to do with the fact that it did not disturb the existing gender hegemonies inscribed in angsa laws. The activism around this legal reform culminated in the final passing of the bill in 2006, just after the second People's Movement (jana āndolan II).Months after Nepal was declared a secular state following the jana āndolan II, several crucial amendments were made to the existing legal code. Most notably, married daughters no longer had to return property after their marriage (as was the case when King Gyanendra passed the daughter's birthright bill in 2002) and thus angsa was effectively granted to both married and unmarried daughters. But when I was in Nepal in the winter of 2008, very few people I talked with knew that all daughters now have birthrights to their parents' angsa. The reasons for this may have to do with the fact that the bill was passed in the midst of heated political debates about when the elections would be held for a constituent assembly. People's attention was occupied elsewhere. It may also be related to the fact that few women wanted to exercise this right, and it certainly was not culturally sanctioned to do so. The question of the effect of these legal changes on the actual practices of inheritance thus remains to be seen. How one relates to angsa in the contemporary moment is a mark of how one has adjusted to the demands of global modernity; it has become a key marker of class distinction in today's Kathmandu. Class and gender, like all social categories, are discursive and performed social constructs, that is, they emerge through specific styles of talk and practices that index class and gender (Bourdieu  1984; Liechty 2003). One of the key performances of class is in how one narrates one's relation to property. The property reform movement was a crucial site for examining such narrations because it got everyone talking about the proper and ideal relation to property. It got everyone talking about how property was essential in creating crucial distinctions between people with different access to the market and resources. It got everyone talking about the subtle and not so subtle differences between men and women. Though "class" was rarely a category explicitly invoked in discussions of the angsa reform bill, it was implicit in most of my conversations and most articles about the campaign. Instead of referring directly to the madhyam barga (middle class), people used other markers of class: the movement was really for and about "standard" people, some said, or professionals, or simply "the lawyers." Caught up in the foreign world of dollars and international campaigns, some complained, the middle-class Nepali activists had lost touch with the more essential meanings of angsa property. There are several different (and sometimes conflicting) currents of the debate that all relate to the emerging transformations of the middle class. Indira Rana, Silu Singh, Shanta Thapaliya, and the other early activists began their work on the angsa reform for women in the mid-1970s, when there was a general shift in middle-class Kathmandu residents' relation to material possessions and to angsa specifically. As more and more people became engaged in salaried labor, angsa was no longer simply a means to live-a field on which to grow rice or a house in which to dwell.One's relation to angsa became a statement of how one lived. For male entrepreneurs seeking their fortune or education in Kathmandu, attachment to one's family land became a statement of sentiment, not of need. Thus the symbolic and affective significance of angsa remained the same, or may even have begun to swell, precisely in a moment when landed property was becoming less important for middle-class families to actually survive. The angsa reform bill was initiated by a group of lawyers who were part of this emerging professional class. While they were certainly arguing for material and political benefits for daughters, they were also tapping into the changing semantics of angsa in contemporary times. The various invocations and uses of angsa property quickly became signs of moral character and respectability (ījjat) that reflect differently on people in different class positions. Angsa is a vital part of what Mark Liechty calls the "ījjat economy," which is crucial to the construction of middle-classness (2003: 84). As I discuss in more detail in chapter 2, ījjat can be lost or gained by participating in certain practices, by associating with appropriate, "respectable" people, and by consuming particular things (ranging from the latest electronics to private school). As Liechty points out, ījjat "brings together old and new logics of prestige in competing often contradictory hierarchies of value. . . . Calculating middle class ijjat requires an intricate reckoning of caste background and orthodox religious practice as well as consumer prestige, in a host of registers from weddings to education to consumer status symbols" (83). To many professionals and entrepreneurs in the Kathmandu Valley, angsa was no longer considered the most valued form of property, except on a symbolic level to secure one's ījjat. Those who do depend on angsa were often regarded by middle-class urbanites as lazy and incapable of earning on their own. Dependence on angsa has become a way for middle-class professionals to distinguish themselves as bikāsit (developed) in contrast to those who are thought to remain abikāsit (underdeveloped) or lacking initiative in today's Kathmandu. "Education is today's angsa," one of my close friend's father, Gyanu, told me. "It is through education that a child is given skills to earn." This comment was echoed by all kinds of people, including activists arguing for daughter's rights to angsa. Like many opposing and supporting the reform, Gyanu insisted on the equal access to education for all his daughters and his single son. The importance of education as a valid and desired right is even more evident when we look at the cases that emerged after an initial reform bill was passed in 2002, granting all daughters a birthright to angsa. The majority of the cases filed by daughters claimed they were not given the chance to go to school. They wished to sell their portion of angsa in order to purchase an education for themselves. Gyanu's remarks highlight the important fact that the angsa reform movement emerged on the political scene at the moment when personal (niji) property, earned through education and skill, gained importance as a legal and social category, especially for the middle class. Professional men I talked with would often assert the significance of angsa as property they had a right to claim, but were proud not to use or consume it. A youthful eighteen year old, Rajesh, who was preparing to study computer programming in the United States, told me he was disgusted by the entire system of angsa. He boasted that his family had not divided the property for six generations and that he had no intentions of ever separating his rightful portion: to do so would be admitting a dependence he did not want to claim. It was the reliance on this birthright, Rajesh suggested, that ultimately was "ruining" Nepal. "If I were to take angsa," Rajesh said to me, "I would feel lazy (alchī lāgcha) like those boys who hang out all day on the streets, around temple complexes, or in their rooms playing guitar and composing songs all day. I would simply want to play and travel around." For Rajesh, a man's dependence on angsa is a sign of his inability to earn and adjust to the current demands of modernity. Many others like Rajesh enjoyed the idea of retaining angsa, but similarly abstain from transforming land into money and thereby consuming it. They desire the luxury of being connected to tradition, without being tethered to its more restricting demands. For men who do rely upon angsa as a potential source of income, angsa property is a crucial sign of their manhood. Laxman, an electric rickshaw driver from a relatively high-caste Newar family, spoke vehemently against his former wife's demand for her rightful portion of angsa largely because of the humiliation it caused him. For Laxman, angsa was a sign that he maintained some control in the house, even if in the broader urban setting he remained on the margins of wage labor, shuttling wealthier Nepalis, tourists, and students throughout the city. I asked Laxman to imagine what it would have been like if his wife came to the marriage with angsa from her parent's home. He laughed at the question: "I would not have been able to do anything." If women claimed a right to angsa, Laxman and many others feared, they would become arrogant, proud, or egotistical (ghamanḍī huncha). Squirming a bit in his seat, Laxman imagined the effects: "It would be humiliating. 'I have angsa,' she would begin to say. No man would be able to speak to her." Here, angsa is explicitly connected to who can address whom. For both Laxman and Rajesh, angsa also determines how one acts and speaks in other spheres of life. These oblique references to class and masculinity that emerged through the angsa debate were often explicitly about women and their proper place. Indeed, the link between maintaining middle-class respectability and gender has a long history in the subcontinent, as in the rest of the world. In colonial India, the "woman question" became a central feature of middle-class nationalist rhetoric that aimed to reveal the distinctiveness of Indian culture by asserting the difference between Indian and European women (Chatterjee 1993). Middle-class respectability was and still is a moral virtue, built upon maintaining the respectability of middle-class women (Liechty 2003; Mankekar 1999). "Since respectability, sexual modesty, and family honor were predicated on the conduct of women," writes Mankekar, "women's behavior was monitored especially intently" (1999: 114). The angsa laws were one means by which this monitoring of women's behavior and speech took place. Inscribed within the angsa laws are moral ideas about women's respectability, tied both to the regulation of her sexuality and to the proper way to pass down and receive inherited wealth. These ideas of respectability inform how and when a woman can speak on her own behalf. According to many I spoke with, a woman should never appear to demand any form of inheritance, particularly land. I recall a conversation with a well-heeled director of an NGO, Manika Thapa, who had received a portion of land equal to her brother's as a gift (icchā patra) from her father, and she made it clear that she did not ask for angsa; she did not make a demand (māg garena).Many saw the demand for angsa rights by the activists as a sign of middle-class women's greed and arrogance, even though these very same people also declared that angsa was no longer important as a form of material wealth. Thus, the symbolic significance of angsa, with its tie to maintaining gendered divisions of speech and action, retains its value even though angsa is also devalued as a form of wealth by the middle class. Voicing Subjects traces the relation between public speech and notions of personal interiority in Kathmandu. It explores two seemingly distinct formations of voice that have emerged in the midst of the country’s recent political and economic upheavals: a political voice associated with civic empowerment and collective agency, and an intimate voice associated with emotional proximity and authentic feeling. Both are produced and circulated through the media, especially through interactive technologies. The author argues that these two formations of voice are mutually constitutive and aligned with modern ideologies of democracy and neoliberal economic projects. This ethnography is set during an extraordinary period in Nepal’s history that has seen a relatively peaceful 1990 revolution that re-established democracy, a Maoist civil war, and the massacre of the royal family. These dramatic changes have been accompanied by the proliferation of intimate and political discourse in the expanding public sphere, making the figure of voice ever more critical to an understanding of emerging subjectivity, structural change and cultural mediation. Laura Kunreuther is Associate Professor of Anthropology at Bard College.